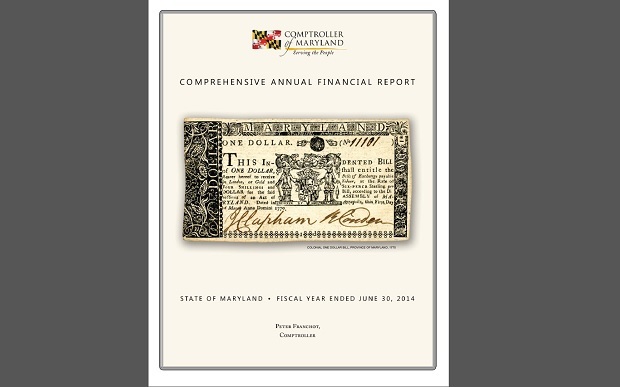 The April 30 edition of MarylandReporter.com included an article penned by Charlie Hayward which examines State finances from a balance sheet perspective. His analysis is based on review of the State’s Comprehensive Annual Financial Report (CAFR), an all too little used or understood reference prepared each year by the Comptroller and confirmed by outside auditors, that organizes fiscal information into standard accounting categories. By applying consistent definitions and categories citizens and bond investors alike can compare the financial condition of different levels and units of government. In his article, Mr. Haywood quite properly indicates weaknesses of Maryland’s balance sheet. Unfortunately, his article tends to both overstate their import and misattribute their origins to the Legislative Branch of government. This is explained below. Perhaps most concerning is the observation that there has been an “average of $925 million of deficit spending in the general fund’s audited financial statements each year since 2008.” While mathematically correct this point is also misleading. Most critically, it fails to recognize that a significant portion of State revenues, principally lottery and casino revenues, are not part of the general fund category in the CAFR. In government accounting terms, the Lottery and Gaming Control Agency is an enterprise fund and its revenues are transferred into the general fund In fiscal 2014, after factoring in funds from all “other financing sources” the State’s CAFR general fund balance exceeds $1.1 billion. The article also refers to “$916 million in negative equity” and contrasts that to the balance in the Rainy Day Fund and concludes that “spending has eliminated the Rainy Day Fund because negative equity exceeds by $152 million the cash set aside in the fund.” A similar comment was made by Moody’s Investors Service in its most recent rating report (which continued Maryland’s AAA bond rating). As above, the arithmetic is correct, but the implication is flawed. The Rainy Day Fund has not been eliminated. In excess of $800 million remains on account with the Treasurer and available to address near-term budgetary needs. At the same time the State CAFR also reflects longer term and contingent liabilities, in particular a large liability which resulted from the recession driven transfer to the general fund of unused balances accumulated in the account from which local income tax revenues are distributed to localities. The transferred funds had been retained as a contingency to pay refunds in the event that the local income tax was repealed. As a matter of policy, the State has elected so far not to repay the local income tax account, which has given rise to a substantial accounting liability. While not commensurable in practical terms to the Rainy Day Fund, this liability will persist until a schedule for replacement of these funds is in effect. Lastly, Mr. Hayward puts responsibility for these issues exclusively on the shoulders of the General Assembly. While the legislature has approved the budgets and statutes necessary to support operations, in Maryland it is the Governor who is the chief architect of fiscal policy. The “To Do” lists to which the author refers are a compendia of actions incorporated in the Governor’s plan and not the initiatives of the legislature. While there is shared responsibility for the result, in Maryland the first and most important steps in budget making are the Governor’s.